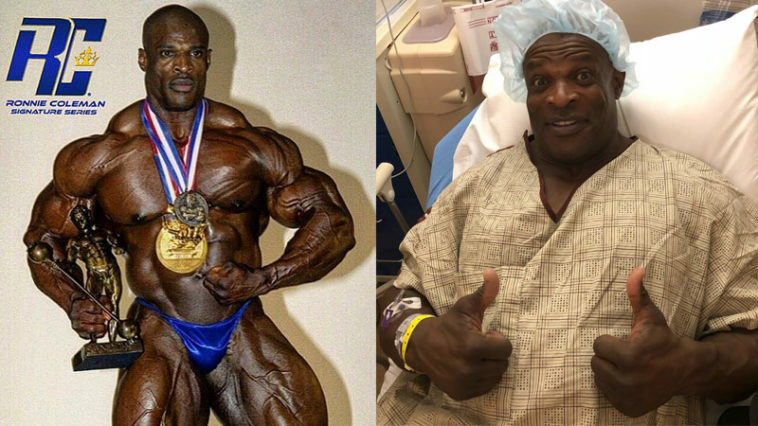 The King of bodybuilding, Ronnie Coleman has announced he may never walk unassisted again. For the former Mr. Olympia and entire bodybuilding community, this is shocking and devastating news. Following his 10th major back surgery, the 53-year old may now be bound to a wheelchair. According to Coleman, this is due to complications in the operating room and the quality of work performed by his surgeon. Understandably, his followers were relieved with some calling Coleman an inspiration. The legendary bodybuilder who once tipped the scale at 300 lb spent a whopping $2 million on his last three surgeries. Because of the hefty price tag for each, Coleman is blaming money as a possible motive for subpar procedures in the operating room. Here’s hoping its better news in the future for The King. After such an amazing career at the very pinnacle of bodybuilding, it would be a sad sight to see Ronnie not recover. We will be following the story closely to bring updates for Ronnie’s dedicated fans. My prayers are with you Ronnie. Hang in there and stay strong. I had a heart transplant as me I know how he feels it hurts brother…keep good in you’re heart, I know it’s tuff,but take ONE DAY AT A TIME..AND THAT MY FREIND IS HARD,BUT ONCE YOU DO THAT,IT will be so much better for you..GOD BLESS YOU BROTHER…. You will walk again in the name of Jesus, I will keep you in my prayers. You taught me to never quit so stand on God word and believe that you will raise again, keep pushing until something change. Hi Ronnie. I hope you recover from your surgery. I’m recovering myself from a back surgery L4 S1 replaced and I thank God I can get back in the gym from last Julys surgery. I will still buy your protein because I was putting weight on before my surgery now I’m back in the swing of things ill be back yeahh buddy get well big Mike. Love big Ronnie but I’m not surprised at his dire state. Too much insane workloads and boatloads of gear. Most top level bodybuilders have truncated careers…and sometimes live as a result. Too many 2500 pound leg presses, 800 pound deadlifts and squats! The human body was never designed for such brutal punishment. Still, I wish this great champion a speedy recovery and every success going forward. Love you Ronnie. Praying for you. I saw you win your first Night of Champions and MR. Olympia in the same year in My hometown of NYC- great job, and you blew the competition away. With God’s Grace and your persistence, you’ll walk again. Be Well and God Bless- “Yeah Buddy! Greedy surgeon? You mean this has nothing to do with you lifting heavy weights between all of these surgeries? I don’t feel sorry for this guy at all. He did it to himself. Hey wish u all the best big man u r a true inspiration and ull always be a king of body building for real. Am always with your pics!! On my phone in my room on my computer.everywhere.Guess what u r and will always be the best. Wishing you the best!! Get well Champ!! Best of wishes to one of the best to ever do it. We all love Ronnie and hope only for the best for him in the future to come. Sorry that you ruined your body Ron. There’s really no one to blame but yourself. It appears you’re addicted to causing yourself undue pain in the gym. Nothing is ever enough…nor is too much. You’ve claimed the only regret you have is not going for another rep on an 800Lb Squat. Your attention to constant extreme poundages & drug use has caused your body to finally break down. After doctors literally put the screws to you to try & hold things together, you returned to the gym performing leg presses etc finally breaking apart the screws which were meant to help you mend. Your addiction has gotten the best of you but you’re like a smoker who has lung cancer and yet you keep on smoking. After every operation, you only made matters worse. 2-3 operations ago, a 4 yr old could run around a quarter mile track before you completed a single lap. Now it appears you won’t be able to make it 100 feet. Addiction is a tough thing to admit. Everyone has a different level before they reach rock bottom. Step 1 is admitting you have a problem. Your blind followers claim they wanna be like you someday…you can set them straight; you can set the insane bodybuilding world straight by telling them the God-awful truth about competitive bodybuilding…on all levels. This would be the righteous thing to do. Blow the lid off the drug use…you don’t have to be a whistle blower & name names…unless it’s noteworthy like IFBB judging, Drug Dealers, Pharmacists, Unsavory Deals for drugs etc… If you can save one life by coming clean, then do so Ronnie Coleman. That sir would be The Greatest Lift you ever did! This time go for a lifetime of reps. Tell others about the drugs you have to take due to all the things you did to your once healthy body. Make sure your house is clean before you judge anybody else. Obviously you’re not a bodybuilder. I’m blas jaimes I’m the owner of sun Protection window tint from Austin Texas I’m sorry to hear what happen to you just would like you to know your strength is in your heart and soul please don’t give up alot of us look up to keep watching you be strong and keep showing us hi ow to do things rights God be with you brother God bless you . Ronnie never give your an inspiration to all the young bodybuilders in the world. I will pray for your speedy recovery. Wishing 8X Mr. Olympia Ronnie Coleman the best wishes on a full recovery. You’ve inspired so many lives, so keep that in mind and keep thinking positive thoughts. Hang in there brah. You the best. Praying for you brah. Wish you nothing but the best brah. Been watching you your whole career brah. You can beat this brah and get back to the stage brah. I believe in you brah. God will heal you brah. Take responsability 4 the choices you made . Be glad your still alive after what you made your body endure.